The Commission will hold a hearing commencing 20 September 2010 at a location to be determined at a later date, commencing immediately following the hearing for the applications referenced in Broadcasting Notice of Consultation CRTC 2010-497. 1. CanWest Global Communications Corp. Application by CanWest Global Communications Corp. (Canwest Global), on behalf of Canwest Television GP Inc. (Canwest GP) (the general partner) and Newco (the limited partner) in a limited partnership that will carry on business as Canwest Television Limited Partnership (CTLP), and on behalf of the licensees of Fox Sports World Canada, MenTV, Mystery and TVtropolis, for authority to acquire, as part of a multi-step corporate reorganization, the assets of the television broadcasting undertakings and specialty services currently indirectly held by Canwest Global. The applicant also requests new licences to continue the operation of the undertakings under the same terms and conditions as those in effect under the current licences. The proposed transaction is for corporate reorganization purposes within Canwest Global as well as within certain of its subsidiaries, and would not affect the effective control of any of the regulated broadcasting undertakings. 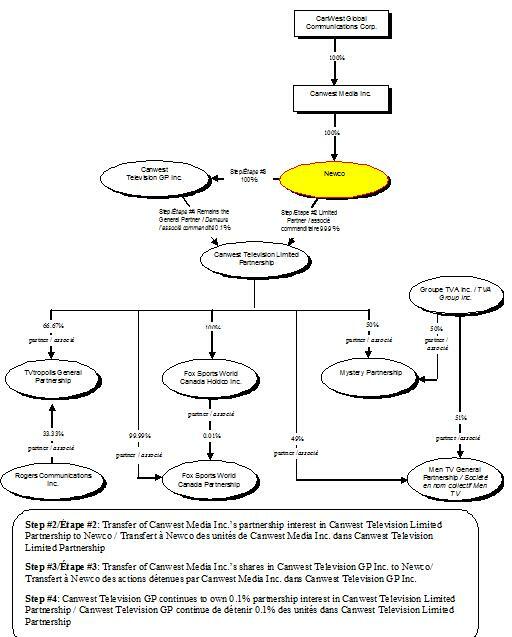 As contemplated in the Plan of Compromise and Arrangement of the Canwest entities pursuant to the Companies’ Creditors Arrangement Act (Canada) (CCAA), the present corporate reorganization involves a change of ownership within CTLP and would result in the issuance of new broadcasting licences. 1. Canwest Media Inc. (CMI) would liquidate and dissolve 4501063 Canada Inc. (4501063 Canada), a wholly-owned subsidiary of CMI and currently parent corporation of (Canwest GP. Following the dissolution of 4501063 Canada, Canwest GP would become a wholly-owned subsidiary of CMI. 2. CMI would transfer all its partnership interest in CTLP to Newco, a newly-created corporation that would be a wholly-owned subsidiary of CMI. 3. 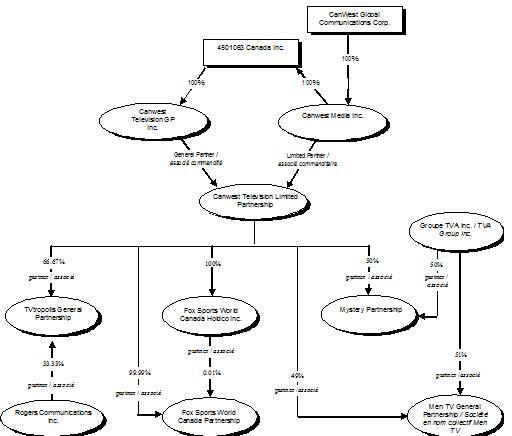 CMI would transfer to Newco all of its shares (which represent a 100% voting interest) in the capital of Canwest GP. 4. Canwest GP would continue to own its 0.1% partnership interest in CTLP. 99.9% partnership interest in Fox Sports World Canada Partnership. Application by Shaw Communications Inc. (Shaw), on behalf of CanWest Global Communications Corp. (Canwest Global) and its operating subsidiaries/licensees, for authority to transfer the effective control of Canwest Global’s broadcasting entities to Shaw, through a wholly-owned subsidiary of Shaw known as 7316712 Canada Inc. (7316712 Canada). On 6 October 2009, Canwest Global, along with its operating subsidiary Canwest Media Inc. (CMI) and certain other subsidiaries, filed for creditor protection under the Companies’ Creditors Arrangement Act (Canada) (CCAA). At the beginning of November 2009, Canwest Global, with the assistance of RBC Capital Markets, commenced an equity solicitation process to identify potential new Canadian investors. On 19 February 2010, after arm’s length negotiations between Shaw, Canwest Global and the Ad Hoc Committee (comprised of holders of over 70% of the 8% senior subordinated notes issued by CMI due 2012), Canwest Global’s board approved Shaw’s offer. On 31 March 2010, Shaw filed an application for approval of its acquisition of effective control of the conventional and specialty television undertakings indirectly owned by Canwest Global. Under that original offer, Shaw was to subscribe for Class A Voting shares representing a 20% equity and 80% voting interest in Restructured Canwest for a minimum $95 million in the aggregate. On 3 May 2010, Shaw acquired from Goldman Sachs & Co. affiliates (Goldman Sachs entities) 29.9% of the voting shares and 49.9% of the common non-voting shares in the capital of CW Investments Co. (CWI). The Commission notes that this transaction was subject to the notification requirement pursuant to the Commission’s regulations. On 4 May 2010, Shaw advised the Commission that, pursuant to an amendment to the 31 March 2010 application, Shaw’s indirect equity interest would be 100% of Restructured Canwest. Shaw also advised that, in addition to acquiring the shares of CWI indirectly held by Canwest Global it would acquire, by way of an option, the remaining shares, held by Goldman Sachs entities in the capital of CWI, immediately following Commission approval of the application. 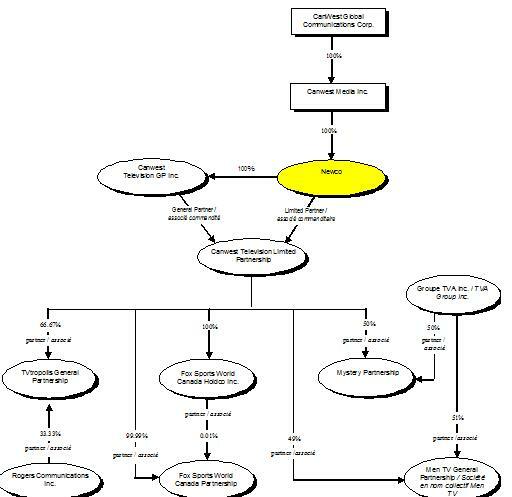 On 18 May 2010, Canwest Global filed an application (2010-0854-0) for authority to effect a multi-step corporate reorganization for restructuring purposes as contemplated in the document entitled “Plan of Compromise, Arrangement and Reorganization” of the Canwest entities pursuant to the CCAA and resulting in the issuance of new broadcasting licences. This application is also being considered at this public hearing. 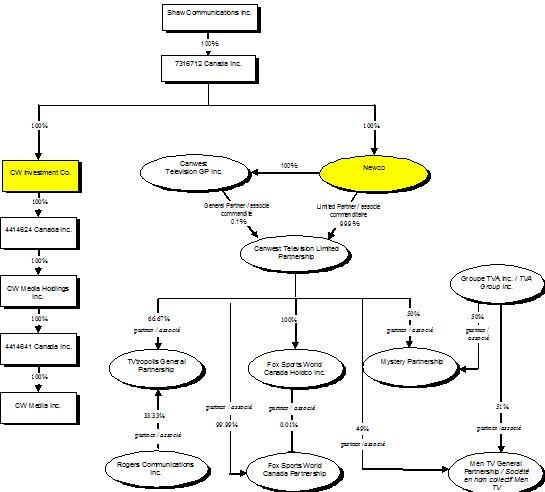 Finally, on 23 June 2010, the consolidated “Plan of Compromise, Arrangement and Reorganization” pursuant to the CCAA and the Canadian Business Corporations Act was filed with the Ontario Superior Court of Justice. 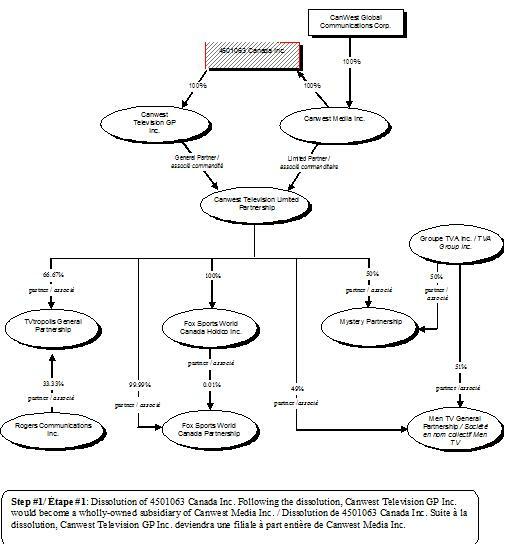 Following the proposed transaction, Shaw, through its wholly-owned subsidiary 7316712 Canada, would become the sole owner of Restructured Canwest and of CWI, and would acquire control of all broadcasting undertakings currently controlled by Canwest Global (see Appendix 2). Shaw has ascribed a total value for the acquisition of all broadcasting assets owned by Canwest Global of $2.005 billion and has proposed a tangible benefits package in the amount of $23 million. In the context of the proposed consolidation involving two major broadcasters, the Commission may wish to discuss the potential impact on the television market (i.e., market power that Shaw could enjoy and the potential to adopt anti-competitive behaviour), and may examine various related ownership issues. The Commission may wish to discuss the value of the transaction applied to the assets and how these values have been allocated between the broadcasting undertakings. The Commission may also wish to discuss the proposed benefits package in terms of incrementality, acceptability, and proposals in respect of any benefits that may be found to be unacceptable to the Commission. The Commission, in applying its benefits test, has been consistent and rigorous in requiring that (1) expenditures proposed as tangible benefits be truly incremental; (2) such expenditures be directed to projects and initiatives that would not be undertaken or realized in the absence of the transaction; and (3) as generally required, applicants demonstrate that expenditures proposed as tangible benefits flow predominantly to third parties, such as independent producers. Structure finale à la suite de l’acquisition par Shaw de Newco (une filiale de Canwest Media Inc.) et de CW Investments Co.